I’ve been asked several times recently, “What is the best gun for rabbit hunting?” I will attempt to answer that question, but will begin by saying, I don’t believe there is a single “best gun” for hunting rabbits. If you asked a half-dozen serious rabbit hunters this question I can guarantee you will get several different answers! Gauge – one of the great things about rabbit hunting is that you can hunt with just about any shotgun in your closet or gun safe at home. I have hunted rabbits with everything from a single shot .410 to a semi-automatic 12-gauge. I only rabbit hunt over dogs so I will rule out .22 rifles. They certainly have their place for stalk and jump rabbit hunters, but they are too dangerous when dogs and other hunters are involved. The goal in choosing any hunting gun is to match the gauge or caliber of the gun to the game animal and terrain you will be hunting. 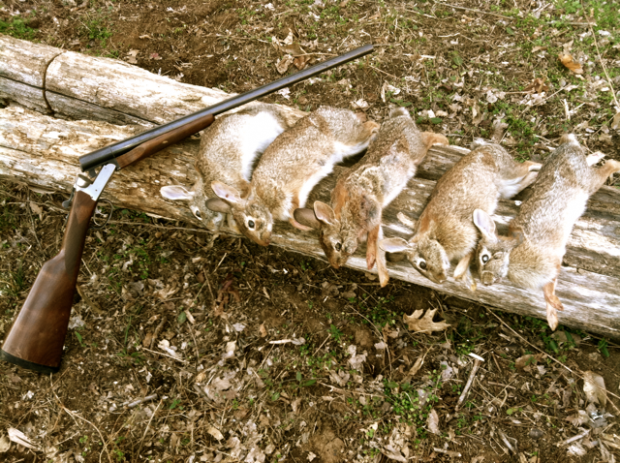 In my opinion the 20-gauge matches up very well for cottontail, snowshoe hare and swamp rabbits. Additionally, the shells are readily available and priced affordably. The .410 is a great choice for young hunters and those looking for a bit more of a challenge (and don’t mind missing a few shots). The 12-gauge, used by many is certainly a fine rabbit gun, but I would speculate for most it would not be their first choice. However, the 12-gauge should not be regarded as “too much gun.” When shooting low brass field load there is really not much difference between the 20-gauge, 16-gauge and 12-gauge. The next time you are buying shells compare the amount of lead and velocity statistics on each box and you will see they are fairly comparable. Any shotgun will work, but if I were buying a new rabbit gun I would pick a 20-gauge. Lightweight – rabbit hunts often mean spending the better part of the day in the field on your feet carrying a gun. I want a light gun that is enjoyable to carry for hours at a time. I often have my hands full as I manage the hounds – the last thing I want is a heavy shotgun adding to the load. Compact – not only do I want a light shotgun, I want one that is compact and able to be shot quickly – not bulky and slow to the shoulder. Barrels in the 22″ – 26″ range are preferred, 28″ and longer barrels are better suited for hunting other game. Workhorse – leave your pretty, shiny shotguns in the display cabinet. When rabbit hunting I often find myself in the middle of thickets and briars and don’t want to worry about putting a scratch on my gun. Adjustable Chokes – with the exception of the .410, which should stay with a full choke, I want to be able to change chokes to match the terrain I’m hunting. Action – single shots have certainly been responsible for adding many rabbits to the game bag, but I personally prefer to have a follow-up shot! Pumps and auto loaders are fine choices, but I like the ease and speed of loading and unloading double barrels. I typically leave my gun unloaded until a rabbit is jumped and running. Throughout the hunt, I unload and reload my gun numerous times. I also like double barrels because I am able to use two different chokes – one barrel set-up for close range shots and one for extended range. If you only have one shotgun, and it’s bulky, heavy and has a fixed choke, take it and don’t feel bad about using it! The main thing is that you get out in the field, enjoy yourself and be safe! My grandfather exclusively used this single shot 12-gauge with a 30″ barrel! It wouldn’t be my first choice for a small game gun, but he knew how to shoot it and he was able to keep his game bag filled! I would have to include the often overlooked 28 gauge as well! I am fortunate enough to have a paw-paw who handed down to me a set of Remington 1100s, one in 28 gauge and the other a .410. It’s usually a morning of the hunt decision, but both do the trick. For me it’s all in the tradition of using the same guns my grandfather hunted with when he had his beagles… You can’t beat that! Thanks for the comment TJ – you are right, hunting with a father’s or grandfather’s gun is truley special! Both the 28 ga and .410 are certainly good guns for rabbits. And while I have shot plenty of rabbits with a 410, I have never had the opportunity to hunt with a 28 ga. I would like to own a 28 ga and seriously considered buying one the last time I shopped for a new shotgun. I picked the 20 ga. as the ideal choice for rabbit simply because of the availablility of price point of shotshells. The 28 ga. and 16 ga. would be fine second choices, but shells are more expensive. The .410 is certainly enough gun, but with the med-fast beagles I run, hitting a streaking target with a .410 proves to be a challenge! Using a Remington 1100 for hunting rabbits is a great idea. The fact that it is still used today proves its quality and excelent craftmanship. The lack of recoil and malfunctioning make it even better. 20 gauge semi auto with synthetic stalks. It is very reliable, Lite weight, and not expensive. Its far cheaper than a Remington 1100. A 20ga or 28 ga in a double gun is the best the same guns you would use for woodcock or grouse hunting are ideal in the brambles light and quick ! You can get the gun up fast on a bounding bunny fleeing beagles ! I prefer 71/2 or 6 shot with cylinder and improved cylinder most shots are are 5 to 15 yards so you’ll need a wide pattern! village. This is because many states have passed laws making it a crime if someone gets hurt in an accident with a gun that you are responsible for. In a sea of lead-spraying semi-autos, the Buck Mark has been building a reputation as an accurate, dependable pistol. You won’t have much room for error if you’re looking to salvage meat, so head shots are your best bet. My favorite rabbit gun is my Stevens 311 16 gauge with IC/M chokes and a tenite stock. The mechanicals are durable and the stock makes it light weight so I can carry it all day. It’s a great gun to drag through the briars and brush. The only downside is that because it’s light it kicks compared to other 16 gauge shotguns but it’s a field gun and I’m not shooting 100s of shots through it at one time. It’s simple survey filling. Even 10$ per survey (10 minutes duration). a lot of time, but you can always help yourself with miftolo’s tools which will shorten the time of creating an article to a few seconds. Great article, I am looking to get into hunting and this was very helpful, thanks.